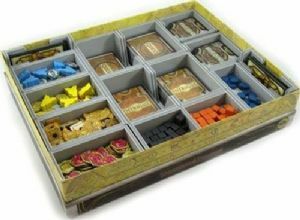 This insert is designed to be compatible with Lords of Waterdeep, and Scoundrels of Skullport expansion. The design provides both efficient storage and improved game play. Many of the trays can be utilised during the game, and they greatly aid set-up and clear-away times. The rules and boards act as a lid on top of the trays. The trays allow for storage of each card type separately, as well as the building tiles. There are separate trays for each player, so they can take their colour pieces and use in-game. The adventurer cubes also all have separate slots to ease access.